Changing public opinion one indictment, one TV commercial, at a time. While President Donald Trump was off in Europe reshaping the continent’s opinion of the United States, Special Counsel Robert Mueller was reshaping the public’s opinion of Russian President Vladimir Putin by indicting a dozen Russian military intelligence officers on charges of hacking the Democratic Party’s computers in the 2016 election. 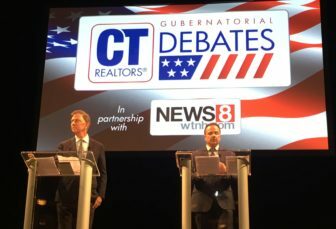 Connecticut politicians, meanwhile, were at full televised stride in their pursuit of victory in the Aug. 14 primary. Women candidates are more numerous this year than they have been for a long time, owing largely to the #MeToo movement and a sense that issues important to women are under unprecedented attack from the right. The state’s two Democratic senators appeared to share that concern when they immediately and categorically refused to support Trump’s nomination of U.S. District Judge Brett Kavanaugh to be his second appointee to the U.S. Supreme Court. Sens. Richard Blumenthal and Chris Murphy, who is up for reelection this year, said Kavanaugh’s appointment would tilt the high court away from access to abortion, gun control, and health care for people with pre-existing conditions under the Affordable Care Act. And despite Trump’s contradictory statements about the usefulness of NATO, members of the U.S. House of Representatives from both parties expressed their full support for the organization. 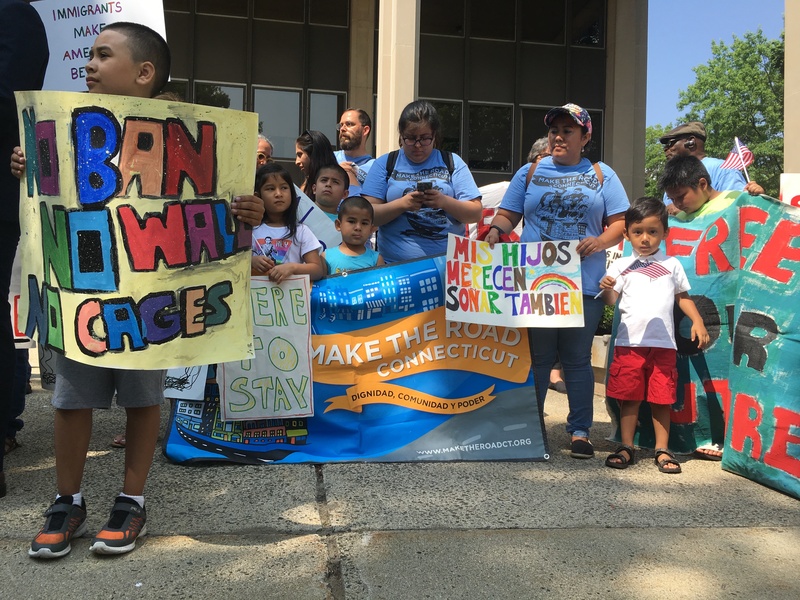 Protesters rally outside the U.S. District Court in Bridgeport on Wednesday before the hearing for the two migrant children. Members of both parties also approved of two proposals by U.S. Rep. Rosa DeLauro (D-3rd District) that would improve the Trump administration’s reunification of immigrant families separated at the U.S. border. Their actions had no immediate effect on a lawsuit brought on behalf of two immigrant children separated from their parents and held in a facility in Groton. But in a more momentus decision, the judge in the case found that the separation was violating the children’s constitutional rights. 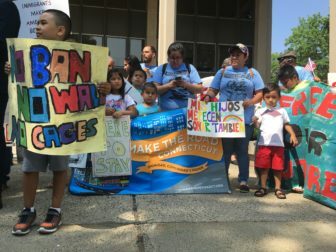 He ordered that their parents be brought from Texas by immigration officials to the next scheduled hearing in Bridgeport July 18. Illegal immigrants got little sympathy from any of the five Republicans debating last week in the run-up to the gubernatorial primary. Nor did they have much sympathy for each other. In the flurry of campaign TV ads last week, Danbury Mayor Mark Boughton and Trumbull First Selectman also sought to distinguish and position themselves with voters. Self-funded Republican candidates David Stemerman and Bob Stefanowski led the field in spending through June 30 — $3 million to $1.55 million respectively. Steve Obsitnik, the tech entrepreneur who has had trouble obtaining public campaign financing, began a video advertising campaign with $100,000 of his own money following Thursday’s postponement once again of his application before the State Elections Enforcement Commission. Ned Lamont, left, and Joe Ganim face off for their first Democratic gubernatorial debate last Thursday in New Haven. Obsitnik’s Democratic counterpart Ned Lamont also hit the airwaves with his first television commercial presenting him as a thoughtful and approachable candidate. His opponent, Bridgeport Mayor and convicted felon Joe Ganim, met Lamont in a face-to- face debate on Thursday and reminded voters that while both men have similar political views on issues like gun control and education, only one has a Greenwich home with eight bathrooms. Meanwhile, the Working Families Party passed over Lamont’s (and the state Democratic Party’s) erstwhile choice for a running mate, Susan Bysiewicz, in favor of endorsing Eva Bermudez Zimmerman as its candidate for lieutenant governor.